The Nefful logo is Company’s most important asset and trademark. 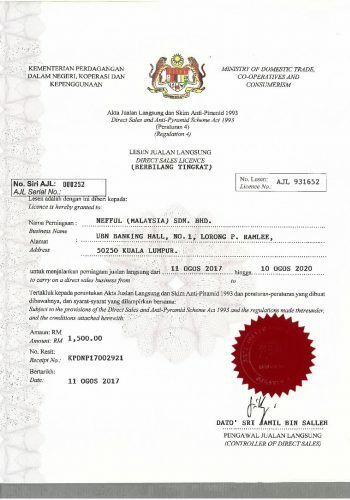 All direct sales members are not authorizes by Company to produce or ask others to produce products with “NEFFUL MALAYSIA” name, logo, trademark items and flyers. Photographs of Nefful Malaysia products are the company’s assets. DM, flyers, and Nefful Malaysia website pictures are under the rights of Intellectual Property. All copyrights belongs to Nefful Malaysia! Direct Sales members must purchase DM, flyers, catalogue, posters and others items through NEFFUL (MALAYSIA) SDN BHD. To copy or print out pictures from Nefful Malaysia website is strictly prohibited. To avoid violation of Medical Law, direct sales members are not permitted to indicate that Nefful Company products have healing effects or cure diseases. In order to comply with and give effect to the Personal Data Protection Act 2010 enacted by the Government of Malaysia, which will come into effect on 1st January, 2013 (Tuesday), Nefful Malaysia will adopt and implement the requirements under the said Act. This is in line with the spirit of basic human rights. It is also to uphold, respect and protect personal privacy of our Distributors. The company will take all necessary initiative and implement measures to strengthen and to improve the protection of all personal data of our Distributors. Therefore, commencing 1st January 2013, all application for membership with Nefful Malaysia will only be accepted upon the company’s receipt of a duly executed of the prescribed Authorization to Use and Disclosure of Personal Data form, failing which the application for membership will not be accepted for processing by the company. In addition, all current members/distributors whose application for membership were accepted without the requirement to sign the said Authorization to Use and Disclosure of Personal Data form are hereby given a copy of the same by attachment hereto and shall be deemed to have accepted and agreed to the terms and conditions stated therein unless a written notice of non-acceptance of the same is received by the company within fourteen (14) days from the date hereof. Participant who join the direct sales team of our company are required to submit a copy of the application form (with information of applcant’s name, identity card number, address, telephone number, name of referee, etc.) and to buy the distributor kit in order to gain basic knowledge of the product for direct sales purpose. 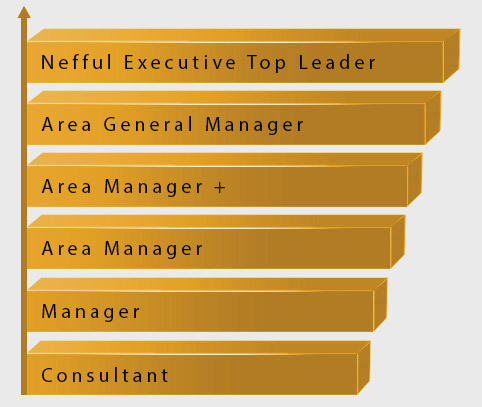 The organisation of our direct sales team is consists of six leves, namely Consultant, Manager, Arear Manager, Area Manager Plus, Area General Manager, Nefful Executive Top Leader.Participant will get promotion in accordance with their sales volume, irregardless of their time of joining.